With wonderful flowers colours ranging from white to yellow, pink and red, Hibiscus rosa sinensis is one of best flowering plants to help create an exotic look in any garden. Often referred to as the ’Tropical Hibiscus’, or ‘Hawaiian Hibiscus’ they are originally from China and are now grown around the world. Hibiscus rosa sinensis is in fact a a fairly tolerant plant. It grows well as far south as Melbourne, as long as you provide the right growing conditions. This is a plant that has been cultivated for many years, and recently new cultivars have been releases with larger and longer lasting flowers. 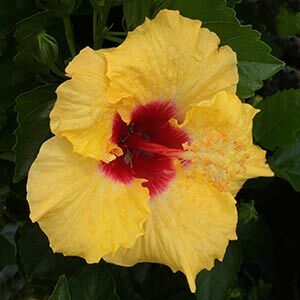 The cold tolerance of Hibiscus sinensis varieties does differ, so consult with your nursery before buying. Use as a feature plant in a warm sunny position, you will be rewarded with colourful flowers over a long period. Also suited to growing in containers. They can be used as a very informal hedge, however tis is best left to those who live in warmer climates. Excellent for planting around swimming pools for a truly tropical landscaping experience. The main factor in successfully growing these plants is planting them in a warm sunny position. In cooler climates, try against a north facing wall or fence. Tuck them in between more cold tolerant plants for a little protection from cold winds. You also need to ensure good soil. Humus rich, moist but well drained. Mulch around Hibiscus sinensis to provide a moist cool root run. Fertilise in spring using a slow release type fertiliser.Repeat in early summer. Best time to prune Hibiscus rosa sinensis is in early spring as new growth commences. Flowering Period – Spring through Summer to Autumn depending on climate.